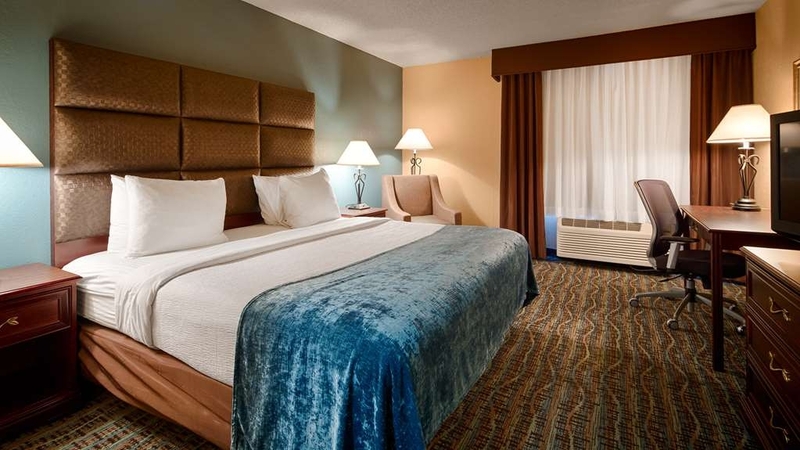 El Best Western Holiday Manor se encuentra en el centro de Newton. Venga y disfrute de las mejores atracciónes turísticas cerca de nuestro hotel. Precios bajos garantizados y ofertas exclusivas. 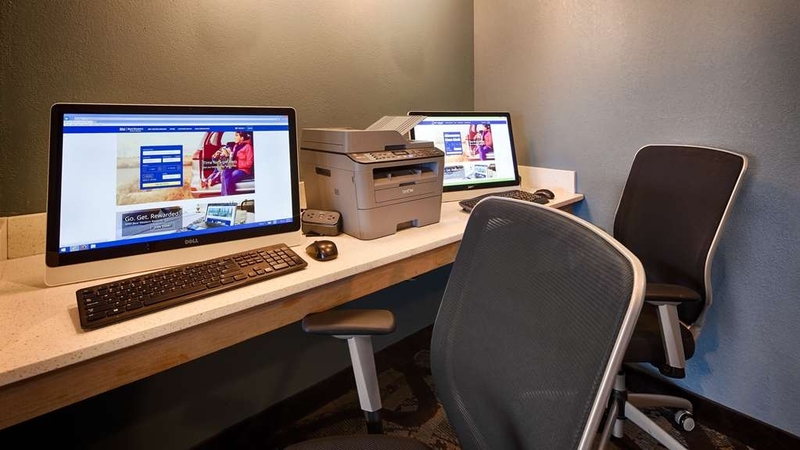 Con una excelente ubicación a solo unos minutos del centro y de atracciones como el circuito de Iowa, los huéspedes del Best Western® Holiday Manor podrán disfrutar de unas habitaciones y espacios comunes recién renovados, así como de numerosos servicios para los viajeros. Diseñado para proporcionarle la mayor comodidad durante su estancia, este hotel que admite mascotas de Newton, Iowa, proporciona el espacio perfecto para viajes de placer o de negocios. Nuestras amplias habitaciones recién renovadas están equipadas con mininevera, microondas, cafetera, tetera y una zona de trabajo independiente. Nuestras habitaciones mejoradas incluyen bañeras de hidromasaje y todas las unidades ofrecen acceso gratuito a Internet de alta velocidad. Nuestro desayuno completo gratuito le permitirá comenzar su día de la mejor forma. Nuestro hotel cuenta con un exclusivo vestíbulo y con recepción abierta las 24 horas con servicio de personal para atender todas sus necesidades de viaje. Los huéspedes pueden disfrutar de piscina cubierta climatizada, gimnasio y estacionamiento gratuito. Amplio espacio de estacionamiento para camiones y caravanas. ¿Se encuentra en la ciudad en viaje de negocios? Este hotel exclusivamente para no fumadores está situado a solamente 10 minutos en auto del aeropuerto municipal de Newton. El espacio de reuniones del hotel, con capacidad para 30 personas, y nuestro centro de negocios están a su entera disposición para su mayor comodidad. Los huéspedes en viaje de negocios podrán disfrutar de una estratégica ubicación a poca distancia de Trinity Structural Towers, Vernon, Thombert, Rock Communications, Graphic Packaging, TPI Composites y Ambassador Steel. Nuestro hotel está situado frente al colegio universitario comunitario del área de Des Moines y a solo unos minutos del colegio universitario de Grinnell. ¿Listo para explorar? 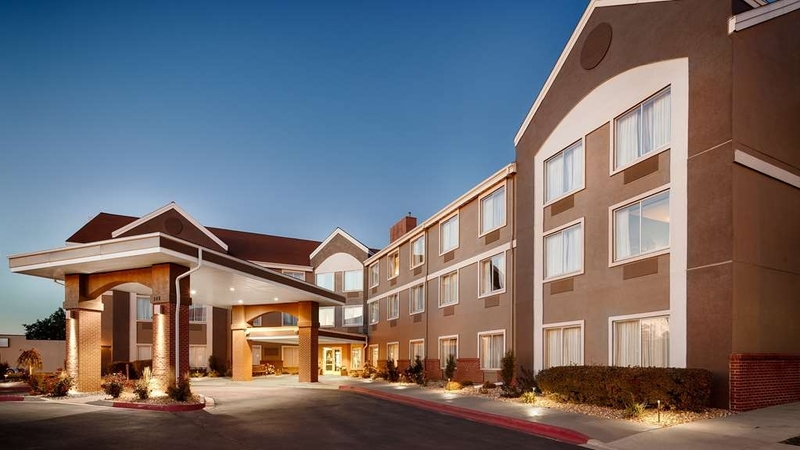 Las atracciones locales, entre las que se incluyen los circuitos Iowa Speedway y Knoxville Raceway, Adventureland Park y el Prairie Meadows Casino se encuentran situados en las inmediaciones de nuestro hotel. Visite las rutas de senderismo en Agnes Patterson Park o disfrute de un día de pesca en el Lago Red Rock. Si se encuentra de visita en la ciudad durante el mes de agosto, no olvide asistir a la mundialmente famosa feria estatal de Iowa. Realice su reserva hoy mismo en el Best Western® Holiday Manor hoy mismo y ahorre. Disfrute de su estancia. While driving to iowa I called 8 times at different times and no one answered the phone, when I got there to check in the front desk staff were not at desk and were standing outside to smoke right in front of the door. While I spoke to the awful general manger that that shouldn't be more than a front desk worker with her poor knowledge and management stills, my concerns were not even addressed the problem. I got into the room and it as not vacuumed and I let it go as it was only my wife and I and we were ready for bed after driving for 13 hours. We pulled back the blankets to find a sock in the bed.. Gross. so I called down and was told the hotel was booked and there wasn't any clean rooms and the manager could possibly give me $10 off my stay! ended up getting out own clean bedding and making it our self. the next morning there was no wifi or hot water and when I talked to the general manger she was still hung over, which isn't real professional, then my wife and i went for breakfast where the breaksfast lady was really rude and was nosey and her and the manger was sitting and rinking coffee and eating, the food was very cold. Then while trying to check out no one again was at the front desk and but lone be hold they were all in the back gossiping and not helping he line of people there. When i adressed amanager again about hte sock in the bed and how her staff were dressed in street clothes and were not friendly, she told me i wouldnt et a discount and how my platuim status meant nothing and i need to leave and not come back. Lets just say back in 2016 we stayed at the same hotel and had a wonderful stay. While the pool was done the manger was very polite and staff seemed to care. Not sure what happened but this place has really went down hill and i hope you owners pointed to the problems and they are fixed and i hope you get a new manager as the one you have is horrible. and to top it off you have your workers living and smoking in the rooms and when i knocked on the door i was told its none of my business and after this stay from hell i will be not coming back to your hotel and i will let my company know not to come to this hotel! Please update your horrible staff, and get news ones or get the old ones back because this place is going no where but dug into the ground. "Clean, Friendly Staff, Good Breakfast"
We had a block of several rooms reserved. The hotel was clean. 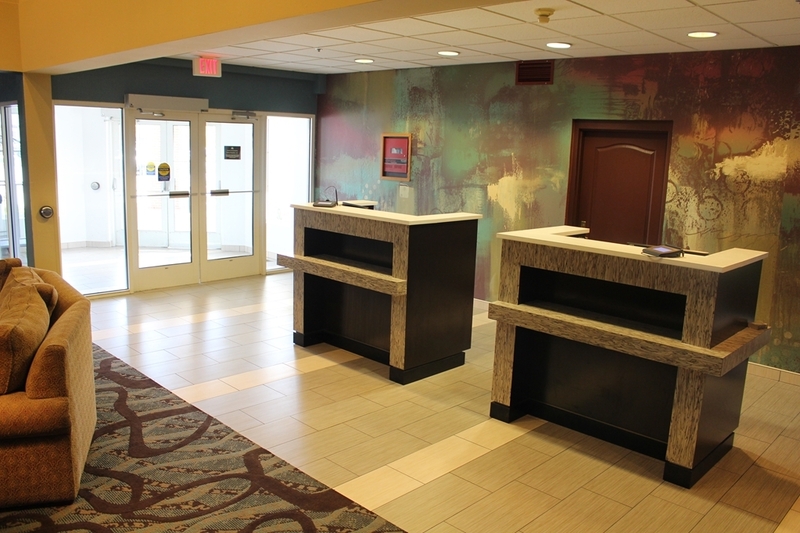 The staff was helpful checking in our large group and was accommodating throughout our stay. Our room was comfortable. The breakfast was good. My family will stay here again. The king bed was very comfortable, the breakfast was very good with plenty of choices, the Internet connection was great. My only complaint is the shower water was warm instead of hot. Also, there was no morning newspaper which is minor. "Poor service and Bomb scare"
"Dear WIFI signal where are you"
This hotel is located in the downtown district. Plenty of thing to see and do. My only issue was the internet. I couldn't get a strong enough signal to even connect and ended up using my phone to connect. Thanks to unlimited data plans. Other than that this hotel was clean friendly and well maintained. "Great place to get stuck!" Got stuck in Newton, IA during a snowstorm. Ended up at the Best Western in the middle of the night. Alisha was ready and made the check-in super easy for 90+ high school kids and the adult chaperones. The hotel was clean, warm and the rooms were very nice. Alisha made sure we had everything we needed immediately. She even set up a room for all the kids to have breakfast the following morning. The complimentary breakfast was super for the kids. Lucy made sure everything was stocked and ready when kids arrived. This hotel has an amazing staff! They were all so kind and helpful. Special call out to Alisha, Heather and Lucy! You gals are a dream!! Thank you for making Sat. night/Sun. morning bearable for all of us in the storm. From the Johnston Show Choir students and parents. poor customer service as the morning wake up call arrived earlier than requested & breakfast server mocked my business- which 150 people work for this business in this community. No one asked her, she just spouted off. No one thought it was funny or charming. We stayed at Newton Best Western when we were visiting for family baptism. We had a good experience. The room was clean and quiet. The breakfast attendant both mornings was friendly. Breakfast was tasty. The pool water was warm and the swim was thoroughly enjoyed. "Perfect place to stop !" While on a road trip, we didn't plan on anything, but sure glad we found this place !! Staff was amazing, room was beyond cozy, quiet, clean, and super great breakfast !!!! Was blowing snow in the evening but sure felt safe and secure in this place !! Thank you again !! Dear Valued Guest Thanks for your valuable time to review our service. Great to know that you liked our hotel and enjoyed staying with us. We are highly motivated to receive such a nice comment. We will be extremely happy to see you again. Drove to Denver & back for the Thanksgiving holiday. Planned overnight stop after first day's driving. Found an oasis of warmth & comfort after a long, cold day. Staff was great- very welcoming & helpful. And the room was just as welcoming- comfy bed with everything we needed- fridge, microwave & excellent WiFi. Tasty breakfast got us off to a great start the next morning. Thank you! We recently stayed at this hotel over the holiday weekend. The staff was friendly and attentive. The breakfast was really good, very clean area. Everyone we encountered was helpful. We had to call the hotel after we left as we thought we lost something in the room, the person at the desk put me on hold while she went back to our room and checked for our lost item. Turned out we found it in our car, but it was very nice of them to stop what they were doing to go look for us. I would definitely stay here again. Don't forget to stop at Maytag Blue Cheese Farm while you're in the area! "For Newton, IA -- this is a GREAT hotel"
I spend a few nights here a year -- my parents still live in Newton. My mom is right across the street essentially -- at a retirement home. The rooms are pretty cheap anyway and I get an extra discount on top of that. The rooms are big, comfy and a nice getaway from the family when needed. I usually enjoy a dunk in the indoor pool, but the heater was broken and it was closed for the time I was there. Not a big deal. The welcome area is very nice -- with a fire going in the fall. They've got breakfast each morning. Now, I didn't eat there -- because i was usually with family relatively early -- but I did see it fairly crowded. Recently -- I've seen some not-so-great reviews of this place. I had wondered if it had gone downhill since my last visit. NOPE! I still really think this is a really nice hotel. I give it an EXCELLENT rating -- because of its location. You don't see many hotels in small town Iowa like this one. Well-managed! I tried for 3 days to get someone at the hotel to answer the phone, and the voice mail was full. That should have been a clue. Arrived to 3 people standing at the front door smoking. Yuck. Checked in, ceiling tiles in the hallway were falling down, first room smelled like mildew so bad I asked for a new room. Next room, a smoking room, ugh, still smelled better than the other one. Water damage on the ceiling that you could tell had been patched. Room felt unclean, the chair was really stained, the bath tub was dirty and didn't drain very well. Luckily it was just a pit stop. The area seemed a little questionable. We were glad we could see our car from the window. Different men were going in and out most of the night, not sure what that was about. Needed extra towels, couldn't find an employee and the room with the towels was open so I just got my own. Employees were either dressed in regular clothes or very unkept BW clothes. Very unprofessional. Breakfast made my husband sick, which made for a bad day for driving. I didn't eat breakfast. There are other hotels in the area. Try one of them. Main problem was that sink did not drain which meant we could not use it. I had read some reviews before booking but thought that maybe many of the problems would be fixed. Apparently not so! It seems management at this sub standard hotel does not care. Although the price was great, we were disappointed. First on a day where the temps were over 90 degrees they had the front door propped open and therefore lobby very hot and steamy. Hallways were not really clean however room was very clean. The TV did not work. Staff indicated they were having problems and maintenance person had just left after fixing the same problem for multiple other rooms. She called maintenance but we still had no TV all night or next morning. Breakfast was sub-par since eggs were cold and sausage was barely warm. When checking out we were never asked how service was, not good customer service. Front desk staff is awful and will not do more than the simple check-in/out process and cannot even accomplish that task properly. Multiple night stays do not get refreshed rooms daily so you will run out of towels and toiletries, even when requested to have a clean room, it does not happen. Happened 1 out of 3 days for our stay and I am a Diamond rewards member. Immature staff that is on their phones, hiding out of customer's sight and not attending to any customer's needs and complain the whole time. I travel I-80 several times a year to visit family in Illinois. I always stay at this Best Western in Newton, Iowa. 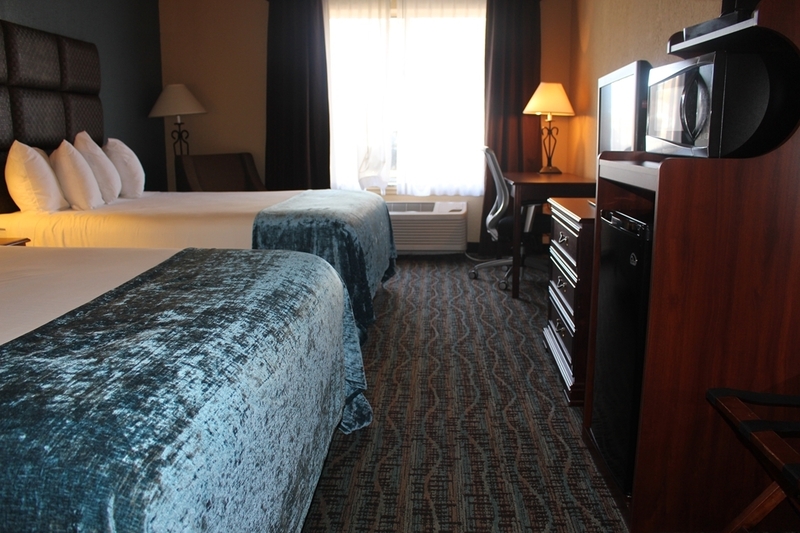 The staff is friendly and welcoming, the rooms are clean, quiet, and comfortable. The location, in town, offers me walking opportunities since there are sidewalks. This hotel also has a nice indoor pool but no hot tub. The breakfast room is a little smallish but the food is always fresh and ready! First time visited this hotel. Property is good but poorly managed. Staff is not properly trained. Every time they handed over a room key , it was not working and staff was help less. Wasted much time at check in and check out. "Do Not Recommend this Hotel"
I stayed 3 nights over the Labor Day Weekend. The people there were nice, but two were dishonest. I could not have taken a shower if I wanted to; the baths were a trickle stream of hot water. I told the desk, the guy said he would have someone look at it, but nothing changed. I told the manager on the day I left, told her about the dingy sheets (they were cheapies, grungy looking, not hotel quality linens) and the dingy and stained towels, plus the hot water problem. She said she would issue me a $10 refund for each night to total $30 and would email me the receipt. Her last name was Thornton, Linda or Laura Thornton. Never received her email, my credit card does not reflect any refund, she was never available when I called and never called me. When I told her of the dingy linens, she said that shouldn't be because they had just gotten new linens. Anyway, I got no refund as promised, but since I booked thru hotels.com, they gave me a voucher for a future hotel booking within the year. The manager at the hotel should not have lied to me and should have taken care of the hot water issue. Would not recommend this hotel. There are newer nicer ones in Newton. Very unsatisfied as there was no hot water for showering. Upon calling the front desk, the response was "wev'e had alot of people getting ready this morning". If this hotel can't provide hot water for their guests, they shouldn't be in business. I do understand your frustration on the hot water. I have checked into the situation we had a new heater installed that is energy efficient. Sometimes going green is not always better. Your feed back is important to me and I welcome you back to the area next time you are here to give you 100% satisfaction you deserve. Second time staying here. Last July I also stayed multiple days it was dated but cleaner now the rooms are not reel clean. just look up around top of curtains ,bathroom had bad smells, carpet needs replacing. They need to update furnishings . The staff seem friendly enough but seem to do their shift and don't really care about the buisness. Management definitely needs to look into it. I will look for other commendations next time I'm in town. Definately felt like a cheap motel but charged like 5 star hotel!! If I wanted to stay at a motel 6 I would have!!! pay the extra 15 dollars and stay at holiday in !! Almost forgot I checked in with credit card advised I would be paying with cash when I departed staff stated no problem and noted on the bill. But when I departed the clerk was waste deep in a breakfast plate of food and acted like I was bothering her and she stated they don't take cash only credit cards ? She just didn't want to put her fork down and do the extra work!!! As I said best western needs to look into this hotel they are loosing business!! R. Stephenson Fl. "Watch out for the additional in room safe fee"
"As usual the best chain"
Quality stay, clean facility, good breakfast, BEST WESTERN IS BEST!!!!!!!!!!!!!!!!!!! Very nice staff, easy parking. We have stayed at other (stupid me) and will always look for Best Western. The other chains do not come close in quality. We were looking for a Place to stay after going to Adventureland and I am glad we had reservations because it ended up being a crazy rainy night. The staff was very accommodating and pleasant to deal with. The beds were so comfy I slept in until 8:00 which is not normal for me. The breakfast was filling and the coffee was perfect. I would definitely choose to stay here again if the opportunity arises. Love this hotel! 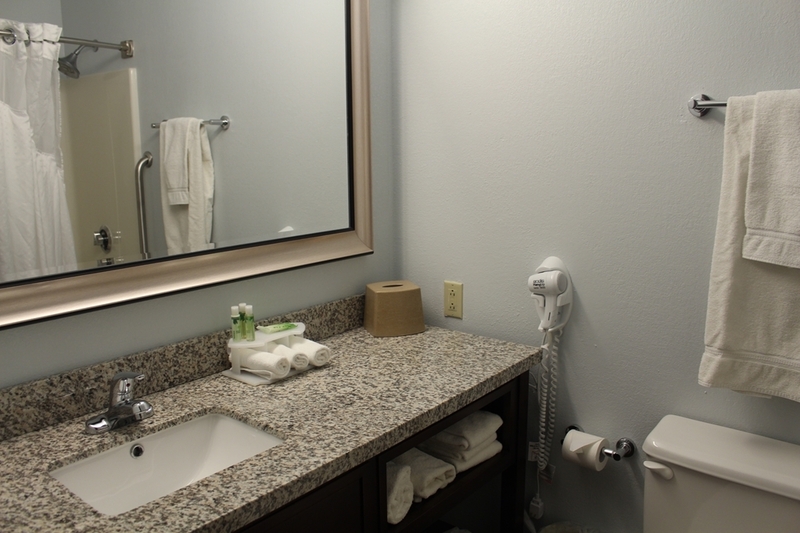 The people are friendly, rooms are large, comfortable and clean! A couple of miles from the interstate, but worth it! Cute town! Breakfast was great! Gluten free and dairy free options! We'll stay here again when in the area! This was not the fanciest hotel that I have stayed at but it IS the best hotel value that I have seen. Bigger than average room with a decent size fridge. Nice bathroom, comfortable bed, and even a small pool. Breakfast was also way better than average gluten free and dairy free options. Typical waffles but also scrambled eggs with bacon and link sausage! We love staying at the best western in Newton! You are greeted very nicely! The rooms are always clean and welcoming! They allow pets! The breakfast is always hot and fresh! With so much to choose from! The lady in there greets everyone in the am and is constantly keeping it clean and nice! This is by far one of the nicest hotels I have ever stayed in! "Off the highway, but worth it"
We were traveling in a camper with no ac and a heat advisory in the area so we decided to find a hotel for the evening. Neither of us are fans of hotels but this one was a pleasant surprise. Friendly staff, clean, quiet room and bathroom, comfortable bed and a great breakfast with lots of choices. This one is a couple miles into town but worth it. We always stay at the Best Western in Newton, IA and they are like our second family. Nice facility and great staff. I would recommend for family or business. It is in the downtown, so you can walk to movies, restaurants and shopping. Leann, Thank you for the 5 star rating. I am delighted you feel its your home away from home when you are here. We at the Best Western Holiday Manor strive on 100% Guest Satisfaction and are pleased your stay was nothing less.We welcome you back next time you are in the area to continue to satisfy your every need along with expectations. This is a very nice hotel to stay at with a reasonable price. The rooms were clean and comfortable and had a pretty good breakfast included. No issues at all.I have stayed here before and definitely will again if I have to stay in Newton. I recommend this place. Mike, Thank you for the TripAdvisor Review, we at the Best western holiday Manor strive in 100% Guest Satisfaction. We are delighted your stay was nothing less. We welcome you back next tine you are in the area. We stay in BW Holiday Manor on our trip to Nebraska and it was a very pleasant experience. The hotel is a little off the beaten trail but very close to interstate and a quite area in the town of Newton. 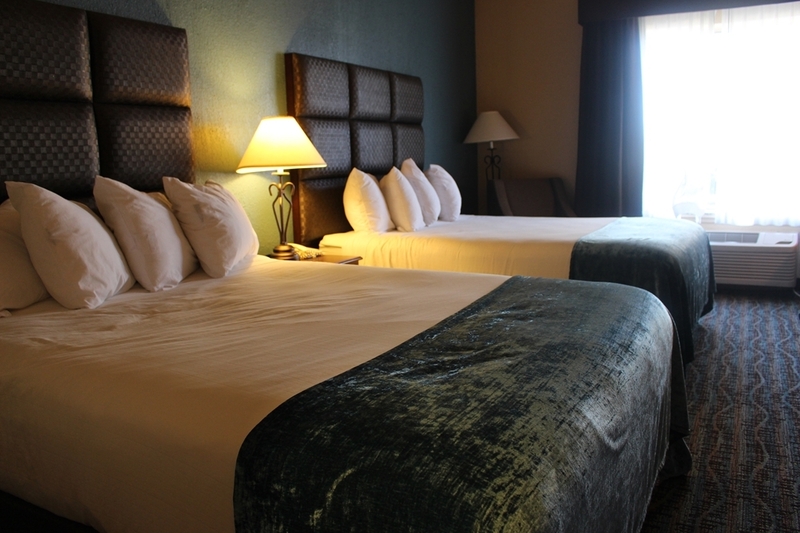 The staff was very friendly and the rooms were clean and comfortable. The breakfast was average. Restaurants were not that far away and there are two ice cream stores within walking distance. Very quaint town and we would definitely stay again. My husband and I stay here frequently visiting my mom at Park Centre (near by) it gives us a discount for this. Lucy, the lady in the breakfast room is a wonderful lady who always remembers our name. They have added clocks with two outlets and two USB plugs to the room on the bed nightstand. This is so much nicer since I use a CPAP, laptop and phone. Reception has changed recently and I miss the other employees that had been there along time. Room is clean and staff is friendly. Arrived with bus tour. Guides had confirmed reservations by phone day before arrival. Clerk insisted we did not have a reservation. Finally conceded that we could stay one night, but not the tw nights booked - and not same types of rooms. Manager out of town. Finally allowed to stay after producing contract and confirmations received prior to arrival. Clerk was belligerent to say the least. Rooms were adequate; breakfast was adequate. Issues with keys working. Would never stay there again. Would give a minus five rating, if that were possible. Thank you for taking the time to write a review. I apologize that your experience was less then satisfying. We will use this for future training and assure that this does not happen with future guest. "Fantastic service - pleasantly surprised"
I was traveling across the country alone with my dog, and I needed a place to stay. I used the Bring Fido app to find a hotel en route to my destination, and this location popped up. When I arrived, the lot was full, and I didn't know where to park. Exhausted and just completely over traveling, I was SO thankful for Bill at the front desk who accommodated me immediately. I decided to stay a second night, and I went to sleep unsure if the reservation went through. In the morning, there was a paper under my door, and I figured it was my invoice. But instead, it was a handwritten note from Bill confirming my second night and ensuring my car was fine. This has been a tough trip, and I cannot praise the staff here enough for making it a little easier. Also, the WiFi is great - I've been streaming video on two devices with no interruption whatsoever. Internet doesn't work and the receptionist didn't bother mentioning it. I wanted to use a Best Western Gift Card. I was told on the phone it wouldn't be a problem. When I arrived, I was told I couldn't use it. The breakfast is stale and the machines don't work. The entire motel is out dated. I would avoid this place! Great rooms, comfortable beds, the bathrooms are roomy and very clean and have plenty of towels. Each room also has a mini fridge great for keeping our travel cooler products in.The Manor is located in town away from highway noise. Wonderful customer service from all the employees. We will always stay here on our travels east.We really appreciate the complementary breakfast. There are so many items to choose from, eggs, sausage, bacon, toast, at least 4 cereals to choose from and fresh bakery, muffins, danish, bagels. There is fresh coffee, juice, milk & fruit & yogurt. "Travel the extra couple minutes off the highway to get to this quaint, quiet & clean hotel "
Very friendly & accommodating staff at the front desk. Clean, nice rooms! Breakfast had something for everyone, very impressed for a traveling family of 6. Lucy is a gem in the breakfast area. She keeps the kitchen in order with a morning smile and a nice greeting to those passing through!! Very happy with our stay at Best Western Newton. The kids loved the pool, rooms were nice and big, good breakfast with lots of options. Location is good and quiet. We would return if we come back to Newton. "Best eggs for a breakfast." The room was very comfortable, the pool looked great but I got there to late and had to leave to early. The breakfast and lucy was great. Best eggs around. The only neg was the light coming through the windows was a little bright and it did not have dark shades. I was double charged for my room and the property (inside and out) was very noisy late into the night. It was not what a weary traveler needed. The staff were under qualified to handle issues, which led to greater dissatisfaction. My biggest concerns were the billing errors and noise complaints. Terry, We at the Best western Holiday Manor strive for 100% Guest Satisfaction. I am truly sorry for the inconvience of the Volley Ball parents had on your stay. Its unfortunate that a group of parents can allow themselves to behave that way. An when asked to go to their rooms they should of been escorted off the property. I welcome you back for a nice cozy stay at 50% off your next visit. Hotel has been remodeled and very nicely done. Hotel staff very nice and accommodating. One thing I really liked is that the hotel feels like it's been built solidly. It's quiet. We've stayed in other “somewhat new hotels” in the Newton area and it feels like they just “slap” the hotel up without the quality factor. Would stay here again and would recommend. This is the second time my family has stayed at this hotel and told them the pool is so cold. 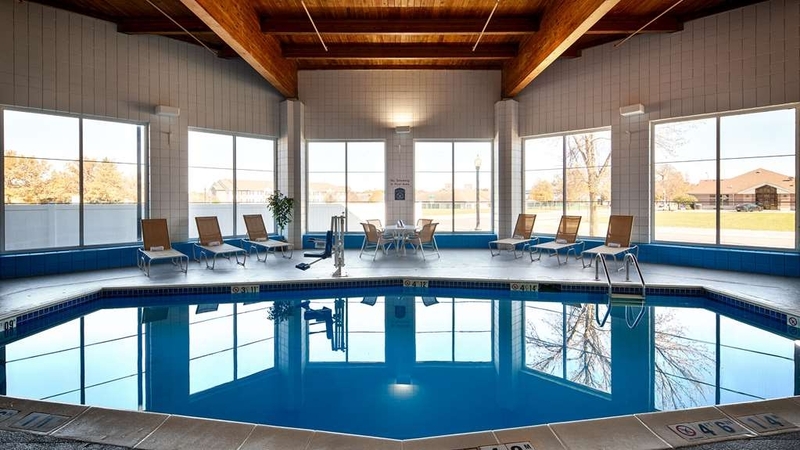 We initially chose the Best Western because of the indoor pool. I have a ten year old that loves to swim. The first stay, we reported that the water was cold. We decided to give it another try thinking it would be fixed. My son and brother went to get in the pool and it was freezing. We will be looking for another place to stay when we are in Newton. "Good hotel, bad cold pool"
Hotel was off the highway. Not a bad place. We made the reservation based on the fact that they had a heated indoor pool. When we got checked into the hotel we discovered that the poll was not heated, and very cold. We were unable to use it. We considered moving to another hotel, but we didn't want to pay for two hotels for the same night seeing as we already occupied this room. Disappointed to say the least. "Nice place to stay with low rates and excellent staff!" Had a very nice stay! The rates were low, Staff was friendly, the pool was very nice and clean and warm. Rooms were clean and I thought the whole decor of the hotel was very nice and cozy. I have already recommend this hotel. Rude staff short a couple overnight staff to lazy to get coffee for room. Looked down upon for using my points for free night was not offered any amenities for elite status. Was rather disappointed. Especially with as much as it cost. Great and easy check in and check out. Very quiet and great breakfast during my stay. Room was clean and everything was in working order. The king sized bed was very hard though. Stayed on a Sunday evening so food options for dinner in town were limited which is no fault of the hotel. "Don't Believe Everthing You Read"
Devan thank you for your hospitality. Other than this, well, the hotel website is filled with false information. The new manager is disappointing. No pillowtop beds, pets are allowed, not hot tub in the pool area, guest laundry is poor, room was 40' F upon arrival, (most of these were stated differently in the hotel website). The whirlpools are in suites, the pool area tub is gone. Guest dryer is broken. Took hours to warm up room, had to leave door to room open in order for heat to come in from hallway. There are other choices to consider in the area. Try Grinnell area. I always stay at this hotel when traveling to Kansas. It's an intown, safe experience. Not far off the highway. I love the staff, so kind. They always make me feel welcome. The hotel rooms are comfortable. We were thrilled to find such a nice place to stay in Newton, Iowa. We have family in the area that we would like to visit more. After discovering the Best Western Holiday Manor we know that we will be able to visit more often. We really appreciated the clean, comfortable accommodations. Great room rate, too. We haven't stayed in a Best Western in years and we were pleasantly surprised. This motel is new and beautiful. Everyone was friendly and everything was clean. The only thing I missed was pitchers of ice water with breakfast. I was given water from the faucet in the kitchen area. I would still highly recommend this motel . Great looking hotel and clean very comfortable rooms. It is well worth the extra few minutes it takes to get off the interstate and get to it. It is only a few minutes to reach it and then you are right downtown and very close to the Newton DMACC campus and convention center. Excellent staff and service. Thank you for your uplifting comments. The staff and myself take pride in our hotel. Worth it to drive a couple of minutes downtown. Nice hotel, nice lobby and pool, nice room. If traveling I80, this is a good place to stop for the night. Very safe setting just a couple blocks from town square. "Well lit and surprisingly great value"
Up to date room decor with lighting better than high end hotels. Good breakfast with many options. Refrigerators and microwaves in rooms and pet friendly. Coffee could be a little better. Great value. Thank you! I am glad you enjoyed your stay. A hidden jewel, for money a great value, quiet, clean and nice furnishings and supplies. TV was a little hard to get used to, only there one night. Shower was awesome with good pressure and volume. And has a good number of outlets, usb's for for tech and cpap's. Thank you for your kind words. I am happy you notice the newly installed outlets and USB ports that are there for all your needs. The highlight was the personable staff. The hostess at the very tasty hot breakfast was very helpful. The front desk staff was very kind and knowledgeable about the area and helped me find where I needed to be. The room was clean, the heat worked very well, and the bed was comfortable! We have stayed there many times and have never been disappointed. Rooms are large and comfortable and breakfast is generous. Staff are very friendly and rates are competitive. Located in quiet area of town. Thank you for your kind words. We thank you for choosing the Best Western Holiday Manor in Newton, Iowa. This hotel is like a second home to us. We always stay here when we visit family in Newton. The location is in town and you can walk to restaurants and the downtown businesses. The staff is super friendly and helpful. They go out of their way to make your stay enjoyable. Thank you for your kind words and we look forward to seeing you again. IF you are looking for a place that is a quick on and off from the interstate, this isn't for you. You will have to drive a few miles from the exit to find this one. But it is well worth the search! Staff was super friendly and helpful. Rooms were great. There is no restaurant on site. But the hotel is located right downtown, and there are many places available just a block or two away. They do have hot breakfast here, with a PANCAKE machine. (Nice change from the DIY waffles!) My only issue was the pool area was closed for some reason. Otherwise, this one is well worth searching for. "Nice clean hotel and nice people"
We were very tired from the days trip, and the people working here were wonderful. The facility is very clean and wonderful. Everyone was quick to make sure our needs were met, and made the stay very nice. Thank you and I will pass your kind words on to the hotel staff. Loved being off the interstate and getting the feel of a small, lovely town in Iowa. Easy check in, decent room, pet friendly, well lighted to walk dog after dark, good breakfast and nice staff. We did have an issue with our sink, but with a few towels and a bucket, problem solved. We were too settled in before the problem was apparent, and had no desire to change rooms. Not much of an inconvenience. Hope it gets fixed for the next guests. We would stay here again when we make our trek from Colorado to Illinois and back. "Excellent spot to stay right downtown!" This is a great place to stay when visiting Newton and it is located right downtown instead of out by the freeway. Wonderful staff, nice facility, good breakfast. I highly recommend trying this place out first. This is a nice hotel if you can find it! Coming off the freeway we followed the one arrow to the other hotels and drove back and forth not finding it. After stopping twice to talk to people finally one woman said, you are not the first to stay here, Quality Inn, to get directions, it is in town. She gave us good directions to the hotel 3+ miles away!! I'm sorry you had trouble finding the hotel. "Friendly, professional and attentive staff." Wonderful place to stay especially when there is positive and friendly staff who greets me with a smile and accommodates my needs. I highly recommend staying at this quiet hotel. Never been disserviced ever. I needed a place for a quick 8 hour rest. This hotel was far enough from the bigger cities to provide good value. It wasn't too far from the main highway (I-80), so it fit the bill. I used some member points during my stay, there was a little confusion on how to apply them to my bill, but it was resolved in the end. 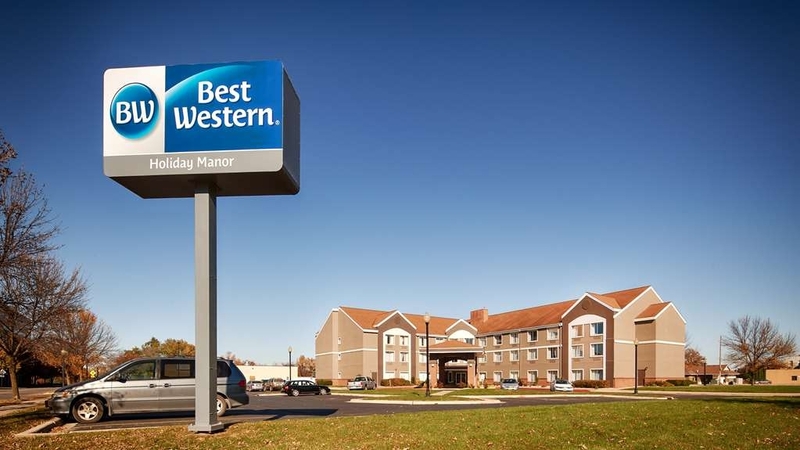 Thank you for choosing the Best Western Newton Iowa. Best value and quality in motel stays I've experienced in a long time. Staff was helpful, and cheerful. Breakfast was very good, and facility was very nice. Marked down as the place to stay on our next trip West. "Watch for the extra charge"
This motel is roughly a mile off the freeway, but Google got us there without problem. Overall, a standard mid-range motel, with nicely sized room that included a fridge and microwave. Breakfast was about average--could have used some eggs, meat, etc. ; plenty of yogurt, cereal, bread though. I would have rated higher except for one thing: they add a $1.50 charge per night in excess of the booked rate. Why? Supposedly to pay for the safe in the room. This is a new one on me. The charge on the bill looks sort of like a local tax (they call it a local charge), but it's not. When you check out and contest the charge, they will remove the charge without argument. Still, this up-charge, which is sort of like the places that hit you out of the blue with a resort fee, left me with a bad taste, and you have to wonder how many guests simply just pay the bill and leave without any idea they paid a little extra for something they didn't expect and didn't use. Thank you for taking the time to write a review. If you have any further questions please call the hotel directly. "Nice motel in a charming town, poor service at the desk"
We're traveling from California to Michigan, staying in Best Westerns along the way. We arrived at the Holiday Manor on Tuesday afternoon to find the front desk deserted. I waited several minutes before I rang the bell. The clerk came out from the office, clearly annoyed at having been interrupted at whatever she had been doing. She checked me in without a smile, and without acknowledging our Diamond status, as has been done in other Best Westerns. Other than that, the room was excellent. I'm sorry and we are looking into this issue. We took our boys on a surprise road trip to Adventureland and wanted to stay somewhere inexpensive but nice. My husband found this hotel and while it is a bit off the beaten path (and by that I mean it isn't right off Hwy 80, but more in the business district) we were pleasantly surprised with the hotel. The entire hotel was delightful. The pool, while small, totally made two little boys very happy. The rooms were very nice and the bed was super comfy and the pillows-the pillows were AWESOME. I bring my own pillow when I travel and while I did on this trip, the pillows at the hotel were excellent! Not too poofy, not too hard, just perfect. I never slept so well in hotel as I did at the BW Holiday Manor. The breakfast has a free breakfast and it had your standard variety of cereal, juice, bagels, muffins, oatmeal, milk as well as almond milk, scrambled eggs, sausages, and instead of belgian waffle maker which I can't stand, they had a pancake maker. Press a button and in less than 2 minutes two pancakes come out perfectly. Not microwaved, homemade. Brilliant. The boys loved the variety of toppings they had like chocolate chips, strawberries, m&m's and of course, whipped topping. I don't get to Newton often, but I will definitely stay here again if we are in the area! "Nice stay in the heart of town"
This was everything you would expect from a nice best western and much better than the Hampton inn we stayed at the following night. Hotel was clean and the staff was friendly plus you can walk to the town square. Stayed there last night in room 206. The main lobby was really nice and the outside looks new...until you walk into the pool area. The front attendant was very robotic and had little personality. Our room looked clean until you looked closer. Found dead squished bugs on the walls of the bathroom and I have no idea what was in the tub. If I weren't so tired, I would've complained and gotten another room. I am so sorry you had a bad experience. "Very nice once you find it"
This property could benefit from better signage at the exit and cross streets since it is some distance from the Interstate. A short drive to restaurants also dings the location rating, but the property and staff are quite good once you find it. The lobby is impressive, the rooms comfortable, quiet and clean and the breakfast is well done. This one is worth looking for. Thank you for the positive feedback. I will communicate your kinds words to all the staff. I would highly recommend the Best Western in Newton, IA. The service was very good, the room clean and the bed comfortable. The breakfast was very good. When the front desk person learned we were there for a funeral, we were offered a discount on the room rate. Thank you for your kind words. We are very sorry about your loss of a loved one. 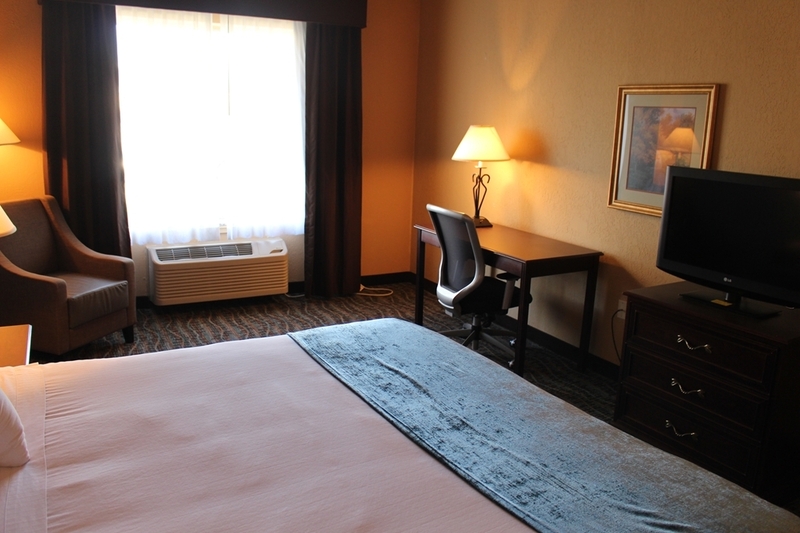 "Business Travel in Smaller Cities Iowa"
Excellent place to stay. 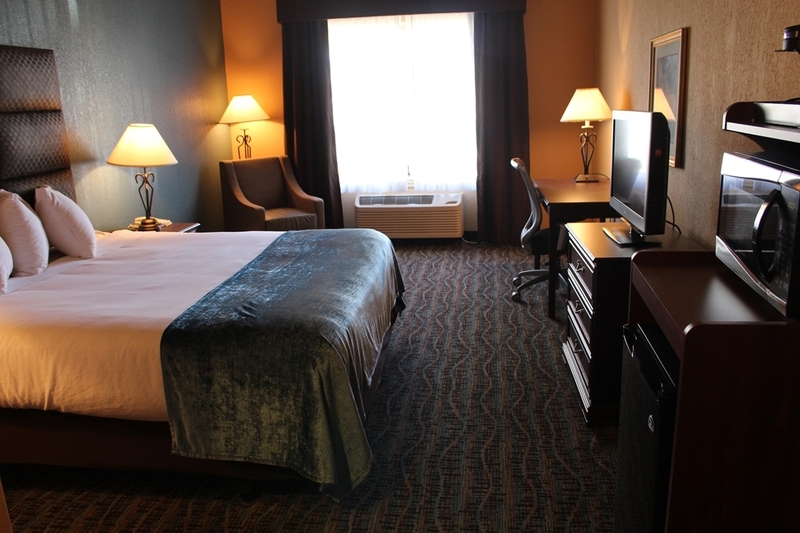 Comfortable beds and clean rooms with complete amenities. The entire hotel team were personable and professional and showed enthusiasm when providing their services to hotel guests. Very strategic location and parking is very accessible. 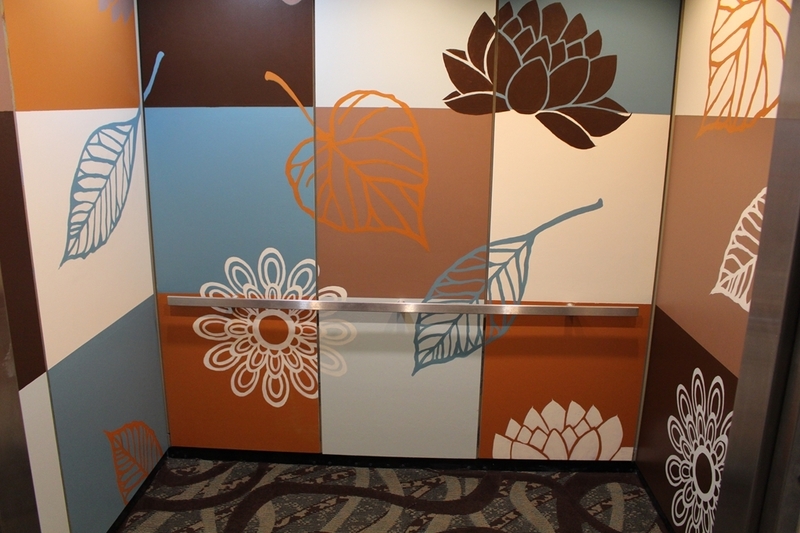 Hallways, lobby, elevator as well as the dining area are well maintained. Thank you vey much. Our team take great pride in provided each guest a memorable stay. Staff was amazing. Front desk clerk, and a sweet young woman she was training, went out of their way when my BW app was giving me problems. Then when our assigned room smelled of stale cigarette smoke we were upgraded at no extra charge and given water bottles for the inconvenience. The new room was clean and smelled great. Another positive experience with Best Western. Very friendly accommodating staff. Spacious room. pillows not the most comfortable. Adequate exercise room and the rates were very reasonable. We are early risers and enjoyed the free 6 m breakfast. Would recommend this hotel and would definitely Stay again if in the area. I reccommend the Best Western Holiday Manor in Newton Iowa. It is comfortable, clean and frinedly. Avery pleasant experiance. I haven't been a Best Western guest in many years. But you can bet my next hotel will be a Best Western. They really have their act together. This is the best BEST WESTERN hotel we have ever stayed at. It also had an outstanding price. The staff was great along with a fantastic clean room and comfortable bed. Breakfast was a hot in a clean atmosphere. The rooms were bright and clean and a good size. The bathroom was fairly large and the shower worked well. The king size bed was comfortable and did not overpower the room.. Eggs with ham and cheese at breakfast were excellent. Sausage gravy was not too peppery or too bland. There was a good selection of yogurts as well. Thank you for your kind words. The staff takes great pride in delivery an outstanding stay to all guest. This was a very enjoyable stay at a most comfortable property. The room I had was spacious, and the staff were almost invariably affable and helpful. It is certainly a property that I would recommend to anyone staying anywhere near Newton. It is only a 30 min trip to Des Moines on I80. There are quite good eateries in less than 5 mins drive. "This is a VERY NICE motel!" I was VERY impressed at the quality, cleanliness, friendliness and value of my stay. I drove by other motels that were very much more convenient to stay at this Best Western. I would do the same thing next time based on my stay there.This looks like a brand new motel. The bath tub didn't drain as quick as it should, but I didn't care about that. I let the staff know so that it could be fixed. My room was incredible, the breakfast was excellent, and I didn't want to leave the property. Keep up the great work with everything. Thank you so much for such a great review. The staff and I take great pride in our hotel. "BW in Newton is great alternative to Des Moines!" A short drive East of Des Moines is Newton, Iowa. BW is perfect stop. Beautiful hotel /rooms, delicious comp. breakfast, cute little town to walk around. WONDERFUL YARN SHOP (The Yarn Barn) one block away. Local restaurants available to. Easy access to I-80. All was good except for the humidity in the room and the water on the floor around the toilet stool. Room had very pretty pictures of the front porches of homes and they made it very comfortable. We are happy to submit this survey but we do not want all kinds of T.A. emails coming to our house. We have enough of them now. "Nice, quiet place to stay....."
We couldn't find an available room for miles but luckily stumbled onto this one on google. It's located off the beaten path a little bit but it's a hidden gem. Hotel had been recently updated. The room was clean, the bed was extremely comfortable especially the pillows which are sometimes lacking at some places. The staff was so pleasant and helpful. Would definitely stay here again. This is an older hotel that has been updated. I really wanted to give this place a 5-star because I liked the employees, and the place was clean. The continental breakfast was good and the place as a whole was nice. Our room was 90% updated but the tub did not drain, so by the time person #2 was done with a shower, the water was up to our ankles. The woman taking care of the breakfast while we were there was very busy and hard-working, but complained the entire time she worked. No hot tub at this facility. We would stay again since the price was right. The staff was very friendly and helpful and the place was nice looking on the outside and clean on the inside. The breakfast was good. There was a good variety of food to chose from. The only complaint is the eggs always had ham in them and we don't eat pork, but there were pancakes and muffins and cereal which made a nice choice for breakfast. I am very sorry about your reservation. "Off the beaten path but worth the find~~~~"
This is the best hotel to stay at if visiting Newton, IA. Friendliest staff and willing to do anything to make your stay comfortable. Was here on business and have stayed at other places in the area which were easier to get to, off the interstate, BUT won't do it again. It's quiet and very clean!!! My room was large and had everything I needed for my extended stay. Breakfast was very good and the lady that kept up with it couldn't have been nicer. You do have to drive for restaurants and shopping even though it's located in the downtown district. Parking is well lit at night and safe. When traveling to Iowa This is the place to stay its in a safe location close to restaurants and close to Adventure Land Park and Knoxville Raceway Loved the lake and easy assess to interstate. Rooms were clean, food was great, lobby was decorated nice like they offered cold beverages and snacks for purchase in the lobby and that it had an elevator loved my trip will stay their again. This hotel is the worse I've ever stayed in, very rundown. The room we were put in was supposed to be a non-smoking room and it stank to high heaven of cigarette smoke. The bedspread was filthy! I will NEVER stay in a Travelodge Inn again! It was also VERY expensive for what we got! Awful experience! So glad it was for only one night!!!! I am sorry for your awful experience at the Travel Lodge but you wrote this review on the site for Best Western Holiday Manor in Newton, Iowa. We stayed here on our way to Knoxville for the races. A little off of the main path, downtown area. Overall it was a good stay. There isn't a great deal close by but the room was comfortable and the free breakfast was tasty. Can't ask for too much more than that! Nice room on first floor Friendly, helpful staff. Good breakfast. Have 2 young teenagers, very disappointed pool closed. If we would have known, we would have picked another hotel. I have very disappointed boys. "Hot Tub would have been a 5"
The only negative I have to say about this hotel is that they don't have a hot tub. We stayed during a road trip and after a long day of driving, I like relaxing in a hot tub. The teenage boys said the full breakfast was "top-notch". They encouraged me to write the review. Thank you for writing a review. We take pride in our breakfast and we look forward to seeing you in the future. Staff and breakfast were excellent. The room was above average. The internet was above average. Staff was informative about great restaurants. Staff helped a family member with an episode of depression. Breakfasts were very good. For an older hotel, they have done a very nice job of keeping it clean and updated. Have stayed here many times and always like the friendly staff. Great location near downtown and Newton is small enough to get wherever you need to go in a short period of time. Will stay here again on next visit. "A gem a few miles off the beaten path of I80"
Denver to Chicago- business trip. Off the beaten path, this hotel is a gem. Clean, with friendly, helpful staff in a sweet little town. I will stay here again if I find myself in the middle of Iowa at the end of a driving day. Lovely view of old courthouse from room. It was nice to be a few miles off the highway. This hotel was very nice. Very clean. Staff very helpful and courteous. I was very pleased with our stay. I was thrilled with the room, the pool, the workout room. Breakfast was great. I needed to extend my stay and they were beyond helpful! Thank you for Choosing our hotel and we look forward to having you as a guest in the future. The beds were VERY comfy and after camping for 5 nights in the Black Hills, it was luxury to have such a perfect night sleep. Breakfast was warm and tasty, staff was very helpful. A little ways in from the highway, but worth the drive in. "Modern, clean and quiet with a generous breakfast." The hotel is a shirt drive away from I-80, so no interstate noise. The hotel is modern, clean and my room was large and had all the amenities including a large fridge. The beds were comfortable and the 4 pillows per bed were fluffy and comfortable. Breakfast was a generous buffet with a big selection of food. I will definitely stay here again when traveling along I-80. We have stayed at this motel before.It is always clean and orderly. The staff is friendly and accommodating. The breakfast room is spotless and the food excellent. It has no restaurant nearby nor a bar, but we always stay here when we go to Newton. Reserve early if there is a race scheduled at the speedway!! Thank you for your kind words. We appreciate your business. "Best Western - Newton, Iowa"
Great service from the front desk , cleaning crew and breakfast room staff. Clean and attractive property. Plus...they accommodate dogs. There was a $20 fee for the dog. However I'd prefer leaving a $100 deposit to be refunded if there was no damage done by the dog. Dogs rarely get drunk and break things on New years, like some people do. We would stay there again if in that area. Although this hotel was a few miles off the interstate highway it was worth the extra few minutes to get there while getting to see this pleasant town. Staff was friendly and helpful. The room was clean and comfortable. Another stay at a Best Western. Pet friendly and excellent breakfast. Our favorite hotel chains. This is a very quite hotel off the beaten path. We would come back here for the friendly staff and food. A very nice, clean hotel. Staff very friendly and helpful. Clean rooms and comfortable beds. Wi-Fi worked well. Breakfast was very good. Hotel is a bit hard to find as it is a ways off the interstate. Google maps or GPS needed for easy location. Very Clean property with very helpful employee. The rooms are very clean. I did not eat the breakfast but talked to people that did and said it was the normal quality of motel food. When I checked in, my reservation was canceled by one of the employees. I never canceled my reservation and the staff honored my reservation. This was on a race weekend and the motel was full but the staff still honored my reservation. I am sure this was a problem on their behalf but they handled it very professional. I am sorry you had a problem with your reservation. Thank you for choosing our hotel and we look forward to seeing you again. "Quiet Hotel in the Heart of a Small Town"
I booked this hotel through Trip Advisor, and I didn't really realize where it was located. I thought it was just off I-80. It's actually in the heart of this small town, right across from the charming town square. My sense is that the hotels out on the interstate are kind of rundown, but this Best Western Holiday Manor was updated, clean, and quiet. I felt like I got lucky ending up with this hotel. It's maybe an extra five minutes from the interstate to go into town, but it's totally worth it. The location is a big plus for me. I went out for pleasant early-morning walks downtown on each of the two mornings of my stay. The desk staff was outstanding. I had several questions about directions, and they were pleasant and informative. Check-in and check-out were smooth. The room was exactly what I expected. The breakfast was ample with both hot and cold offerings. The wi-fi worked fine. The smell of the cleaner they used was maybe a little strong, but I quickly got used to it. Spent four nights and were thoroughly pleased. Staff was friendly, helpful, and readily available. The facilities were clean and comfortable. Be sure to visit the breakfast room where Miss Lucy will make sure you have a nice hot meal. Wasn't sure what to expect getting to the hotel, it was in town and not by the interstate. Exterior of the hotel was nice. Couldn't have been greeted by a friendlier receptionist. Hotel was clean and quiet. There were little leagues there, we thought it would be noisy, but no noise heard. Bed comfortable. Even the midnight shift staff were friendly. Would recommend this hotel to anyone and would stay there again. "Stay for a family wedding"
The hotel was so close to both the church and the reception. Many in our group just parked in the hotel lot and walked to the events. A very clean hotel with very friendly staff. Check in was extremely easy, the rooms set up nicely, and a breakfast that was better than the typical hotel breakfast fare. The only thing I wish was that there was more seating available for families or large groups to sit and visit. It seems like there were many groups staying this particular evening so the breakfast area and lobby were always full. We tried the pool area which worked, but was extremely loud because of the acoustics. Thank you for your kind words. I am sorry you were not able to gather with your family in one area. Thank you so much. We are glad you enjoyed your stay and we hope you stay with us again in the future. "Stay at Best Western Holiday Manor"
Overall, this hotel was clean, comfortable and worth the rack rate of of $80 per night (plus taxes). The service was adequate (not top-notch professionalism with swearing at the reception desk and outdoors during their smoke break). Thank you for your kind words. I will look into and resolve the issues you mentioned. If you have further questions please fill free to call the hotel directly. Had a king suite on the ground floor - large and comfortable. No issues with function or fixtures, all worked and in good order. Complimentary breakfast selection was small but for the price, no complaints. Eggs oatmeal and alternating meats, bacon, sausage, sausage gravy (biscuits) each day I was there (3). A six minute ride to our daily destination so very convenient for our purpose. On a cross country trip with our dog, we needed a pet-friendly place to stay. This was convenient and very comfortable and clean. We'd stay here again the next time we're in the area. There were also some good places to eat by the freeway exit, as well as a grocery store. Nice location not to far away from 1-80. Good size room with refrigerator and microwave. Friendly staff with great bbq restaurant suggestion of Moo's closer to I-80. Drove to arboretum for a walk after dinner. "Yes to pets and a hot breakfast!" Superior property near the quaint Newton city center, yet a quiet, walkable location. Lacks a hot tub and the pool was cold, but the beautiful breakfast area and hot breakfast made up for some of that. Fitness room had two treadmills, neither of which worked that night but we were traveling with two dogs and the cleanliness and welcoming spirit of the hotel balanced out the negatives. Beautiful lobby! Would gladly stay here again. Thank you for letting us know about the treadmills not working. The maintenance department has repaired them. We came to town to photograph a wedding and this hotel was recommended by the wedding couple. We could not have had a more comfortable stay. The location was perfectly located to where we needed to be, and was easy to find. The room was clean, quiet, and comfortable. If we ever find ourselves in Newton again, we will definitely stay here! Thank you for your kind words. We enjoyed your wedding group and we hope to see you all in the future. Thank you for the nice review. We look forward to having you as a guest again in the future. Greetings was very friendly, fast check in, rooms were clean, lighting could be brighter, hot water takes time to get to you, plumbing drainage needs work, pillows were uncomfortable, Breakfast has a nice variety, fresh and hot and lots to eat. Check out a breeze. We appreciate you taking the time to send in a review of the Best Western Holiday Manor in Newton, Iowa. I am happy you enjoyed breakfast and I apologize for the issues with the plumbing and the pillows. Thank you for your kind words. We enjoyed sharing in your special day. We look forward to having you as our guests again in the future. "Excellent staff and pet friendly"
"Compassion when I needed it." My Aunt was dying and I always stay at her house when I come home to visit. I was very upset, not feeling well, and very overwhelmed.The staff were great,supportive;listening,ready with a tissue or a hug. Thank you for your kind comments. We are sorry about your Aunt. We called about an hour out and were given a price for two rooms. One a senior and the other a retired military rate for both rooms. I asked if this was the total for BOTH rooms. I was told yes so we booked the rooms. When arriving we said we'd pay cash for both rooms. To find out the price I was given was per room and my credit card was charged. Guess we werent given the full amount when we asked.... and if I'd known the one senior was paying full price we would not of stayed. What a shame cause we pass through here a lot and we thought this was a nice place. Thank you for writing a review sorry you miss understood the rate per room. If you have any future questions please call the hotel directly. The desk clerk was friendly and courteous. The room was clean and ready for us. It was very quiet on the 3rd floor The hot breakfast was delicious. I would recommend this Best Western to everyone. The price was right and very comfortable. Our family always gets together for Easter and Thanksgiving and we stay at the Best Western. This past weekend we all gathered at the hotel and they were so accommodating as they let us gather as a family in a room to eat our meals. It was very kind of them to open it up for us and let us stay together and spend time relaxing and visiting. The staff is always pleasant and easy to work with. Thank you for taking the time to send such positive comments. We value all our guests and look forward to seeing you again in the future. This is the first time in years I have left Hilton and tried a BW. What a great and pleasant surprise. The hotel was quiet/clean, staff great and the breakfast was exceptional - so much better then Hampton Inn! Great price as well! Recommend without reservation! Thank you so much for choosing the Best Western Holiday Manor for your hotel needs. We look forward to seeing you again in the future. We were in Newton after my father-in-law passed away. We were offered a funeral rate as we checked in. We were there 8 nights. As family arrived for the service everyone was greeted with kindness. Judy, the manager, and the rest of the desk staff were very caring. Lucy has as spotless breakfast room, keeps all food looking attractive and warm, and there is always plentiful food. Lucy is always cheerful. There is a conference room that we used for gathering on Friday night when we had the most family members in town. The room was set up for us to use as a place to gather. The rooms are newly remodeled: the king size bed was extremely comfortable, refrigerator and microwave were concealed in a credenza, comfortable couch, large table/desk, new wall heating/air conditioning units that has a low/high fan cycle and an attractive granite topped sink commode. The rooms were very quiet except on Friday and Saturday night when the hotel was full with a wedding party and guests. Smokers sit/stand outside under the large covered entrance. Rooms on the east and north sides are the quietest on weekends. This is a great improvement over past owners. Best Western has done an outstanding job taking over the hotel which is located just off the town square. A grocery store, 2 coffee houses and restaurants are on or near the square. Thank you so much for taking the time to write a review. We value your opinion. I am truly sorry for your loss. My family stayed here for a funeral. The staff was very helpful and the rooms were great. When we wanted to move to a handicap accessible room, they immediately changed the reservation. The breakfast room was very well attended. We felt very well taken care of during a difficult week. Thank you for your kind words. We enjoyed your family. "Always our place to stay in Newton, IA"
It is always a pleasure to stay at this Hotel. We came to see my 99 year old mother. The room was extremely clean, the price was reasonable, the registration process was easy. We discovered mutual friends. Talked to Lucy at breakfast. We see her every time we are here and have friends in common. Breakfast gives you many choices and Lucy soon knows everyone that comes in. This building was right across the street from the Maytag headquarters. Now it is a location of DMACC. How things have changed over the years. I can remember coming to Newton as a youth and then riding my Uncle's bus home to Colfax after the shift change at Maytag. We reserved 2 rooms and requested to have connecting rooms or rooms next to each other. The lady I spoke with on the phone told me it was taken care of. However, that was not the case when we arrived. Our rooms are across each other making it very inconvenient for our needs. Breakfast was okay. Pancake maker was out of order and the bagels were solid rock. I was pleasantly surprised at the high quality of all aspects of my stay here. 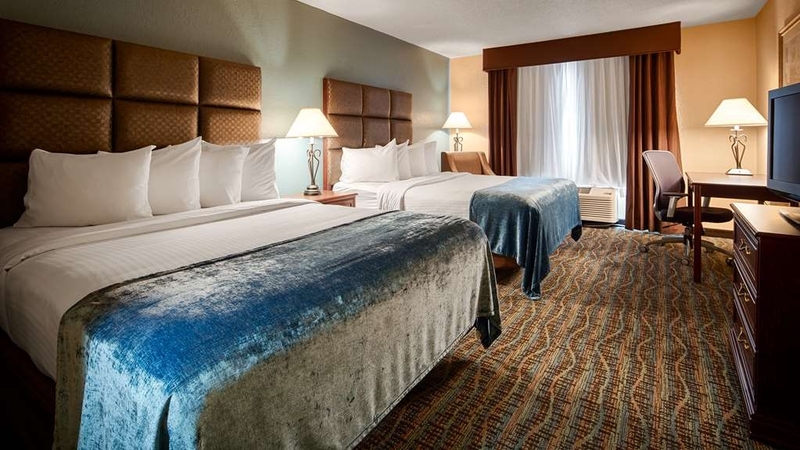 We were in town for a family wedding and this hotel exceeded our needs by not just providing a place to sleep and eat breakfast, but by also providing friendly and helpful staff members, comfortable beds, clean rooms, and an overall positive environment. "Very good place to spend the night"
Breakfast was superb one of the better ones we've had at a hotel. It was a good selection and very tasty!!! We had a very good night but I didn't use the pool or internet room. The outside was very good. My wife checked out the reviews which is why we stayed at this hotel. Keep up the good work and many travelers will stop in to spend the night. It is all about customer satisfaction!!! "Second Time to Stay "
We travel from Colorado to Illinois and prefer to drive a little farther on our first day in order to stay at this Best Western! It is always clean, quiet, and comfortable. The staff are friendly and welcoming. There's a very nice clean pool that is larger than many hotels but there is no hot tub. Breakfast is a nice variety of hot and cold choices! "Convenient, Quiet, Friendly, Great Breakfast"
Stopped in Newton on our drive from Colorado. Great find! The Best Western Holiday Manor is pet friendly, which we needed since we were traveling with our poodle -- they even gave her a welcome gift bag when we arrived. Our room was very comfortable and quiet. The staff was extremely friendly, and the free breakfast was one of the best I can remember -- cheese-eggs, crisp bacon, yogurt, etc. We chose this hotel because it was a good halfway point between St. Joseph MO and Waterloo on our tour through Iowa. We also had enough Best Western Rewards points for a free night. The hotel is clean and very quiet. It is about 4 or 5 miles away from the freeway. Sadly, the city of Newton appears to be a very depressed area. Many empty buildings and closed stores. There are no restaurants nearby. The gal at the front desk suggested a couple that were back next to the freeway. We drove around town a little and finally ended up grabbing a chicken sandwich at McDonalds. Too bad, this hotel appears to be a very nice place. We had no complaints, the rooms were nice and the breakfast was good. TV channels were rather limited. "Do Not Make Online Reservation"
I made an online reservation and called and canceled it over 24 hours in advance. The hotel management is so sleazy, they charged me for two nights and refused to reverse the charges even though it was a fully refundable booking if cancelled 24 hours in advance. BE CAREFUL-they are not honest with billing and will actually lie. The rooms were comfortable and clean. The pool was great! The breakfast was plentiful and delicious! Plus we reserved the party room for a birthday party and it worked out great. Several family members stayed there so it made it convenient. The staff was very helpful and we had a wonderful stay and party! "Always our choice in Newton"
We visit Newton at least twice a year to visit my mother and my family. We always choose to stay at what is now a Best Western. We have stayed here under a couple of previous brands and have always had an excellent stay. Under the Best Western name they have updated and remodeled much of the hotel. It is a quiet, friendly place to stay. The beds are comfortable. The rooms are spacious and have enough chairs. The bathrooms are a little on the small size, but still very adequate. The Wi-Fi worked very well. The breakfasts were the usual better motel breakfast, with pancakes available. Stayed for one night. Hotel is clean, comfortable, lots of parking but not near any food. We had to order in. Off the beaten path but is quiet and secure. Would stay again if ever in the area. Paid $112.37 per night. In downtown area of charming village. Easy to walk to venues downtown. Quiet, pleasant, safe area. Nice indoor pool. Nice breakfast area. I needed help in the breakfast area and an attendant came, .the problem quickly. My husband & I have stayed at the Best Western Holiday Manor Hotel several times. We have had great experiences every time. So when I needed to book a hotel for a trip with my girlfriend, I knew that this was the best location to stay on our travel west. As always we had a great stay, the rooms are always very clean & the beds are very comfortable. The staff was really fantastic & we enjoyed a delicious breakfast with a large selection of food & beverages. Excellent place. Very nice. Clean comfortable rooms. Outstanding breakfast! Good location. Everything was well thought out. A comfortable lobby where my friends and I could meet and talk. Quiet rooms. A very nice pool. All in all an excellent experience. We were attending a wedding in the area and stayed two nights. The rooms were clean upon arrival, however, it did have a musty odor. We just turned up the AC and the smell seemed to get better. The beds were very comfortable and the bathrooms were spacious. Getting on the internet was not a problem. The breakfast was wonderful with many items to choose from. The only down side was that our room was now cleaned the second day. Not a deal breaker but just something worth mentioning. I would definitely recommend this hotel to stay at again. I travel every week for work and the Hotel choices in smaller towns is sometimes somewhat lacking. I was pleasantly surprised by this hotel. My room was very clean, everyone was friendly and professional. The breakfast was better than most I have been in recently and they had an attendant working named Lucy that was wonderful! Only reason I did not rate it a 5 was an employee smoking outside the front door. Good stay at this hotel. Clean, comfortable and quiet. Staff is accommodating and friendly. Hotel is in quaint downtown area of Newton, IA but still close enough to I-80. Great atmosphere. Take a drive downtown and see the Veteran's Memorial at the courthouse. Very nice, seems to be recently renovated. Rooms and lobby area are very clean. Breakfast is good with a lot of variety (eggs, bacon, breads, juices, etc.). Pool area is indoor, a little small but nice. Plenty of parking. This is a fantastic hotel! My wife and I stayed here for two nights last weekend. The breakfast is excellent. They even have fresh pancakes! The staff is very friendly and helpful. They seemed genuinely interested in us, and that we had a great stay! It's perfectly located between Iowa City and Des Moines. It's a cute town near the interstate. "a real off the highway gem!" After a long day in the car and a mess with hotels.com. we were taken care of quickly and efficiently by the front desk. The room was clean, in fact the whole hotel was very clean -- and quiet. Everything from the floors to the towels smelled fresh. The furniture in the room was updated and not beat up or abused as so often happens with hotel furniture. Best part of the hotel is the staff's knowledge of the surrounding area for food. My wife wanted Mexican for dinner and we thought, ok Iowa, we're not going to find good Mexican in a small town. Boy -- well that's my next review - but suffice to say -- that little hole in the wall place should become a franchise it was that good. back to my hotel review - great price, far off the highway, in the center of a very beautiful place and very very quiet. If I'm ever back in that area, that's a planned stop for a place to sleep and a place to eat! This BW was clean, well appointed, had friendly employees and a very nice breakfast with a super nice breakfast lady . Even though we were early due to not planning for a time zone change , we were quickly accommodated and in our room in no time. Clean, comfortable. Friendly staff. Convenient location. And, thank you, thank you for having Pantene hair products. Breakfast items were fresh and tasty. Would stay again. Easy to find from highway but in a neighborhood location. Beautiful room at a GREAT rate. Judy checked us in..was very friendly and engaging. We asked for extra coffee and even though she was in middle of cleaning the front doors she immediately went upstairs and got our coffee. All staff I met were super friendly and helpful. This is a great clean comfortable place to stay! From the friendly greeting at the desk to the utmost comfort of the room and bed, my stay was a perfect traveler's delight. Clean, fresh smelling rooms, a terrific shower and plenty of space afforded a very enjoyable stay. 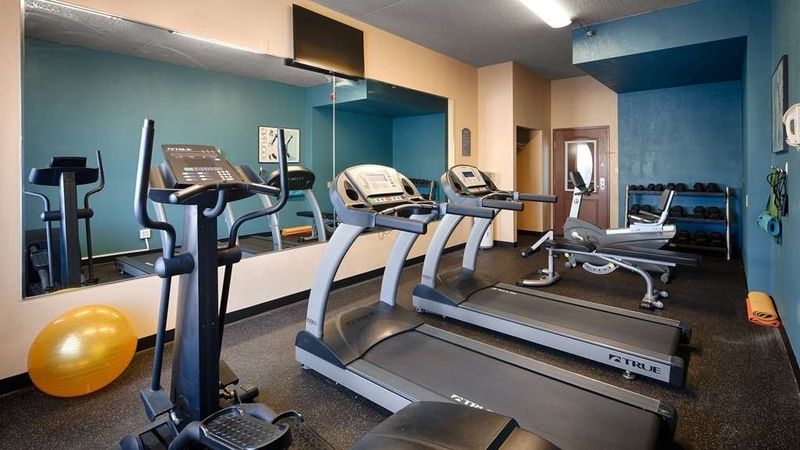 The Best Western is located close to restaurants and bars and the area is pleasurable for a stroll around town. A quiet, restful stop with a comfortable, fashionable room. We enjoyed our stay. The staff is friendly and supportive, the hotel is clean, and the room is clean and quiet. We thoroughly enjoyed our time there and we'll stay there again the next time we are in the area. The staff was very supportive. The room was great. We felt the desk could have been in a different place. The shower was excellent especially the non slip bathtub. The breakfast was excellent . everything was ready on our last day as weh had to leave early. "Hotel stay at Best Western Maner"
This Hotel was one of the best (Best Western) I have stayed at. Location was great, small town. Felt secure. The people were very nice and the place was clean. The rooms were very nice This is a place I would stay at again. Nice updates, friendly staff, comfortable rooms at a great price! We have stayed at this hotel since it first opened and have always been satisfied. We would recommend this hotel to our family and friends. "A Little Off The Interstate But Worth The Trip"
This hotel is near downtown but is a much better choice than those closer to the highway for not a whole lot more money. The lobby and the room were both immaculate, and the breakfast was better than I expected. Would definitely stay here again if in the area. We had originally planned on staying in Des Moines, but due to the State Fair, decent rooms there were at a premium. This Best Western is very nice, and away from the main interstate so that makes it better as you cannot hear the road. Clean rooms, great breakfast, and very nice employees made this stay enjoyable. Plenty of parking too. This place does have a pool, but we did not use it. We stayed here 5 nights during the Knoxville Nationals and found clean rooms, comfy beds, good breakfast and friendly staff all in a moderately priced motel. My only disappointment was the non-working guest laundry. The less expensive hotels were filled so I chose this hotel for about $100 plus tax. I was very pleased with the modern, clean hotel and room. The bed was great and the hotel was very quiet. It was 4 miles off the expressway and harder to find than I would have expected. My guess is that it is often used locally for conferences and weddings. Definitely a step above the typical off the interstate hotel. Stayed 4 days on a wedding weekend. wasn't bothered by constant over attention but they were there when needed. Good breakfast for free. For a small town hotel it was pretty comfortable. The Pool could be bigger and needs a hot tub. "A great place to spend the night." This Best Western was completely remodeled. The bed was very comfortable, the person that did the decorating had an excellent eye for color that was pleasing to the eye. The employees were extremely friendly and courteous. The outside was beautifully landscaped. The breakfast was delicious. 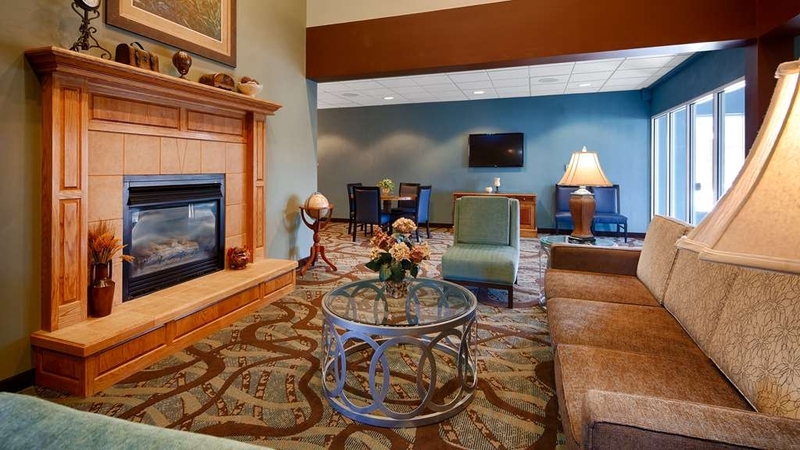 "Good hotel on way to Des Moines from Wisconsin"
Good place to stay a few miles off of I-80. Easy to reach and outside Des Moines. Just one night. breakfast included. Discount if you are a Best Western member. Breakfast had plenty of choices. Beds were good, bathroom supplies the normal amenities. We stayed 2 nights this past weekend. Was blown away! Beautiful entrance, and super friendly staff was my first impression. Our room was clean, nice, and super quiet. Couldn't hear anybody in hallway or next door. The pool was warm and very enjoyable. The breakfast was the best i'd ever had at a hotel (eggs, sausage, pancakes... anything you could imagine)! Plus it is cheaper than most hotels. Very, very enjoyable! My only complaint if I had to choose something would be the parking. There isn't enough of it. I had a difficult time late in the evening finding a parking spot. There was only 1 left and the person next to me was way over my line so I had to squeeze in. Hotel was very nice, well kept, clean and beds were very comfortable. Very quiet location but just a block off of the main street through town. Staff was very friendly and helpful. Pool facilities we nice and clean. Overall a nice hotel and a restful stay. "Very pleased with this choice!" Clean rooms, friendly helpful staff. Great breakfast and overall hotel was clean, welcoming and accommodating. The pool area and front lobby area was clean and inviting. Location was nice, close to I80 and also convenient to the bigger city of Des Moines for runs into shop and other attractions. Beds were comfortable and bedding was fresh, clean and inviting. We would definitely stay again and certainly recommend this hotel to others. "This hotel looked brand new!!" We didn't have reservations, because we didn't know where we would spend the night on our road trip. I called when we were about an hour away and was please that there was room availability. We were very pleased with this hotel. The room was very clean. The bedding and towels were very clean. The pool area looked very inviting, although we didn't swim. The girl who checked us in was very courteous. They had a nice room for breakfast. The breakfast included delicious eggs and potatoes. It seemed like a step up from the normal Best Western breakfast, which is usually very nice to begin with. The parking lot seems a little small for the hotel. When we left in the morning there were cars parked all over the place. The hotel is not right by the highway. It is a few miles off of route 80, situated in the town itself. But not too far off the highway to be inconvenient. The town of Newton seemed very quaint. 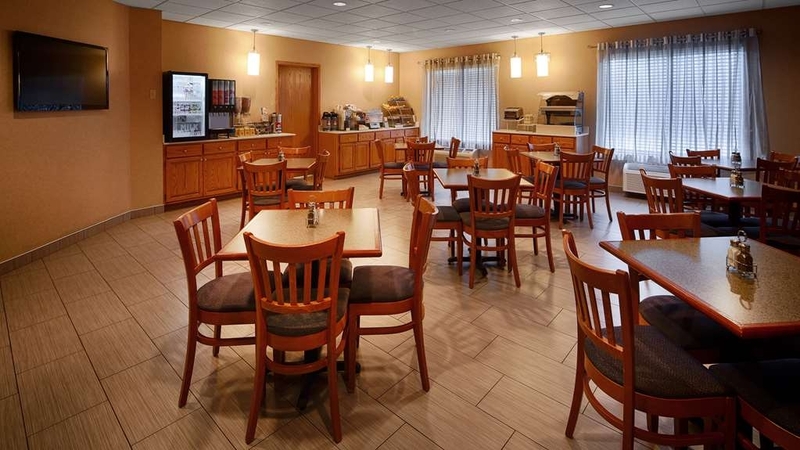 "Newton hotel comfortable place to stay while visiting family at Park Center." I have always had good service at this hotel. Rooms are clean, people are pleasant and nice breakfast in the morning. We stay when we come to see my mom at Park Center. They give a discount because we are going there. The hotel walking distance from the town center. They recently refreshed the lobby, carpets and rooms. Free wifi is good and I love being greeted by the wonder lady who runs the breakfast room. We had absolutely no complaints. Both the hotel and room were clean and comfortable. Check in /check out were quick and easy. Breakfast was much better than expected for this level of hotel. Lucy, who worked the breakfast area, was a joy to meet! Would stay again. As a travel nurse working an assignment at the local hospital, I used to stay at this hotel frequently before it was a Best Western. I am VERY impressed with the improvements and the look of the hotel. I only wish they hadn't filled in the hot tub. :-( The front desk clerk at check-in was very friendly and kind. The room was well decorated, bed was very comfy. The pool area was nice. The breakfast was one of the best we have had at a hotel... scrambled eggs with cheese & ham mixed in, sausage, plus the usuals... cereals, breads/pastries, fruit, yogurt, etc. Very pleasant stay! Very pretty hotel both inside and out. The service was great and breakfast was delicious. Everything in the room was clean and fresh. Bed was very hard and not very comfortable. There is a nice pool, but no hot tub. Make sure you have the address with you because it's not located on the main street which made it a little difficult to find.. There was a blue sign telling us where to turn off the highway, but the next thing we knew we were at the other end of town. Once we looked up the address, it wasn't too difficult to find. Will always stay here when in town. Amenities are terrific, staff is terrific. Location perfect. Only one issue and that is the hot tub has been removed. pool was nice. we played scrabble in the lobby one night and staff was very nice and accommodating. We were pleasantly surprised at all of the amenities this property has to offer. First, the exterior clean, fresh, and nicely landscaped. We needed parking for a long vehicle, more than ample parking. 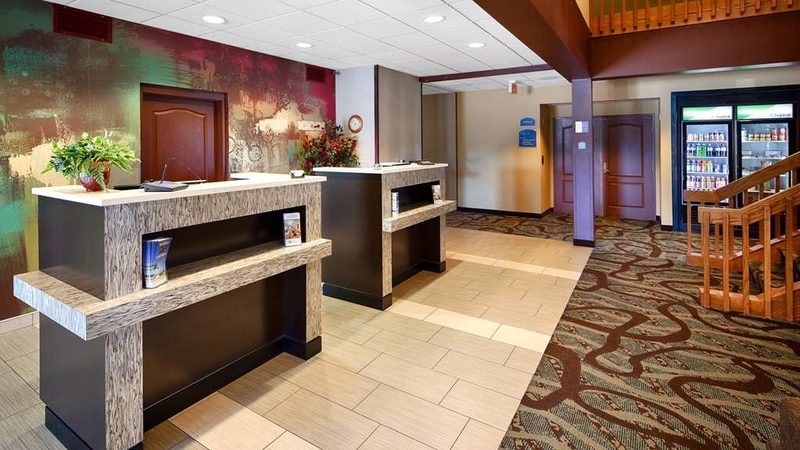 Walk in the door to a well appointed, clean lobby with very friendly staff. The indoor pool looked very inviting. But most importantly, the room was outstanding. Our room was clean, roomy, and the bed was one of the most comfortable hotel beds I've ever slept on. There was a fridge, microwave, desk with chair and another chair in our room along with a coffee maker. The complimentary breakfast was great too. With the standard continental offerings, they also had sausage, eggs, potatoes and pancakes with various toppings. I was also pleasantly surprised to find "almond silk" milk offered. I am lactose sensitive and appreciate the choice! We highly recommend this hotel! 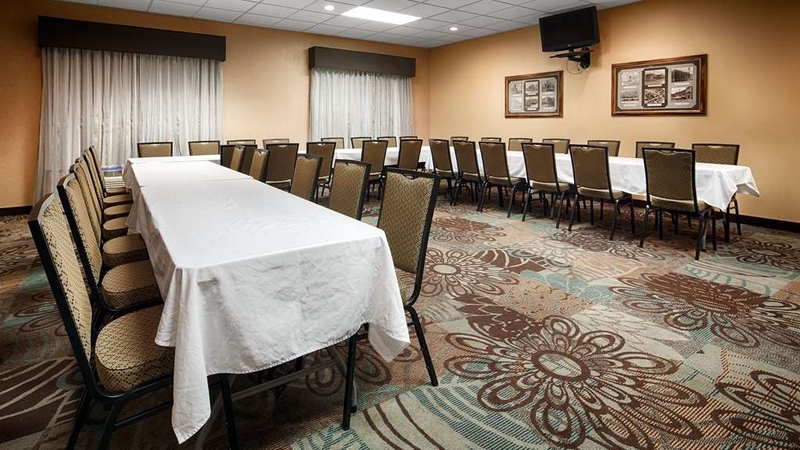 We had several rooms booked for a family reunion. The beds and pillows were comfortable, the rooms were clean and the staff was friendly.The rates were more reasonable than other hotels in the area. I would definitely stay again and recommend the hotel to family and friends. Booked this hotel through the website. Great hotel with comfortable beds and above average breakfast. The cost was much better than most hotels. It is a short distance off the interstate but not hard to find. My 93 year old aunt was in town for a funeral and needed a room for a couple nights. This was 2 nights prior to a nascar race at the speedway, we weren't sure if she would find a room on such short notice, especially as a walk in. The lady at the front desk originally didn't have a room available for the 2nd night, but was able to give her a room that was being repaired. She gave my aunt a very good rate for the stay. This was especially nice since I was on the phone with other (not so nice) hotels, and their rates were outrageous. They were very friendly and helpful with my aunt during the stay. She also said it was very quiet, I was was worried that people would be loud with the races going on. A little out of the way off I-80, in the downtown area of Newton. Nice rooms in a quiet town. Everything was clean and comfortable. The breakfast was the usual... nothing special. There are several choices for dining in town, but most you have to drive to. If you want to get away from the freeway and see a nice small town, then I'd recommend this place. very nice accomadations and when we had a ac issue it was quickly resolved, which was very nice. The attitude of the personel was exceptional, and considerate. They offer some food items in the main entry area, and the pool was very enjoyable. I do not appreciate review comments that require lengthy verbage as this one does. I messed up my reservations in Des Moines, with no rooms available. I found an opening Newton Iowa, which was 25 miles away. It was well worth the drive. Rooms are new and first class! To top that they are very cheap in price! I highly recommend! Very pleasant experience! Check-in was smooth. Accommodations were very impressive. The room was very quiet and comfortable. the room was laid out well with plenty of room to feel like you weren't always bumping into something. Breakfast included everything tou could want in a comfortable atmosphere. "Very nice hotel for the price"
The hotel is beautiful, and the rooms were clean and spacious. The staff was wonderful. The breakfast buffet was delicious and well stocked. The location was in a quiet area. We will stay there again on our next trip. The people were friendly and very professional. They were happy to allow us to have our dog with us as the were pet friendly. Rooms were clean and front desk very helpful. Parking is well lighted and clean. Jacuzzi suite is a good sized relaxing room, good service, quiet hotel. Very nice staff. Pool is small but clean. Very close to local restaurants and Highway. Beds are very comfortable and clean, will definitely go again. "opague billing, non-closing fire doors, good breakfast, friendly staff"
Please check your hotel bill. You might (still) find the term 'local' on it with a USD 1,50 charge. You would think, ah, that must be local taxes. Well, no, it is the charge for use of the vault in your room. Oh, you didn't see you had one and probably didn't use it. Well, then we'll take it off. But who checks their hotel bill so carefully that they spot this unfortunate line? Not enough people to make the hotel from using this practice. Not chic at all. Stop it! Your reputation and the quality of your staff and product is worth more than USD 1,50 per stay! The room could have been a bit cleaner (wet towel by the sink, candy wrapper behind the nightstand). The fire doors in level 3B and 2B could not and did not close (because the carpet is too high/the door reaches to low). I did mention that to the staff and they would have maintenance look at it. The owners do have a good heart because they have put in every effort (and big investments) to make even the pool accessible to wheelchair users. The staff is super friendly and service minded. The breakfast was good and the person looking after it made sure that all items were constantly available, restocked. The Chobani yogurts hit the spot. Recently renovated and re-flagged, this is an excellent choice if you want quiet and comfort. The staff members are well-trained. It has about 80 rooms (HiEx properties now must be 100 rooms). Bed and room features were great. Follow the signs north of the interstate to a quiet, refreshing night's sleep! Clean, helpful. The remote control was not working so they brought me a anther one write away. Front desk signed me up for the rewards club. After 2 visits you get a $50.00 gift card. Very clean and I stay at alot of hotels. "Trip to CA- great place to stay!" Looking for a place to sleep on trip, we found the Best Western on TA. It was perfect! Judy Johnson(Gm) made our stay fantastic! 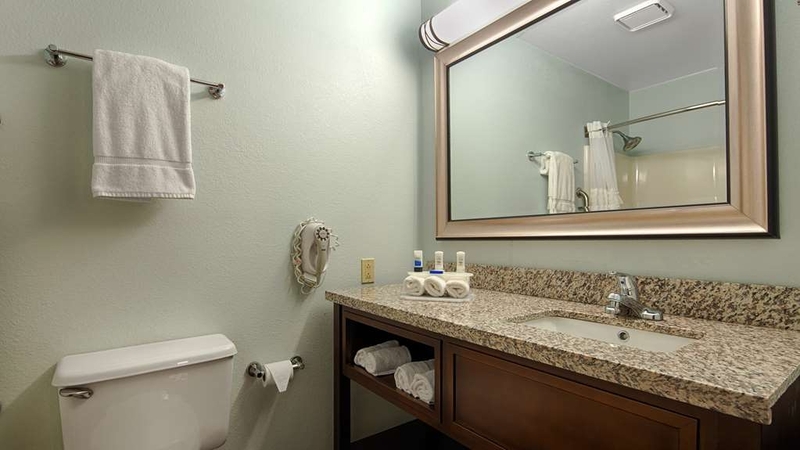 Friendly, courteous, clean & modern amenities! GoodBreakfast also! This is a perfect place for a night or week! They made us feel at home! "An excellent stay a little out of the way"
This is a bright, clean, friendly hotel with great service. It is a few miles off the highway in a quaint Iowa town. Stayed here while attending the Drake Relays in Des Moines. We will definitely stay here again next year when we go to the relays! "Worth Getting Off The Highway!" First visit to property since change in ownership. It's better than our last 4 visits! Super clean, friendly staff, dog lovers and great restaurant recommendation. So when going across Iowa, get away from the freeway to quiet downtown and enjoy a nice stay! I have been staying here many years on my business trips. They have done a major remodel. The room have new feel and smell. Staff is great and helpful as ever. i do miss the hot tub. But pool area is nice. Called the hotel 7 times to get help to hotel not a Single person answered this was around 830pm on April 1st. So i stopped at a gas station and they were able to tell me. When i came in lobby it was very dirty. I thought maybe a lot of people came in and front desk was busy. I walked around and looked at the pool still no one came to the desk. I went and looked at breakfast room and i went to the laundry room to see if front desk was doing laundry. I proceed to say hello twice before i young gal came around the corner with a cell phone in her hand. She proceeded to talk to who ever was on it. I asked if she had any rooms available she proceed to act like i wasn't there and talk on her phone. I finally said forget it and she said act that way i was on the phone with the owners. I said again do you have any rooms available she said you were sold out but the parking lot was empty. So i told her the lobby was dirty she told me that wasn't her job it was the next shifts job. I ended up getting back on freeway and traveling a little till i found a different hotel. The only reason for the 3 stars is because your hotel is beautiful and located in a great spot. I hope to get better service next i come in the summer. we went to our Brothers wedding and stayed at the Best Western. it was a nice friendly place to stay and the people working there were very friendly. We would highly recommend this hotel and would definitely stay there again if a chance arises. We were in a room with a king size bed, very roomy and had plenty of lights for various areas in the room there was a refrigerator for our cooler items, nice size flat screen TV, Wi Fi , large bath room, very comfortable & clean. We later found out that it is also a pet friendly hotel, which is great to know, if we hadn't actually seen the dogs we would never had known because it was so quiet. The location, the price, access to WiFi, and quality of the room was excellent. I also enjoyed the food at Mountain Mikes. The breakfast was OK, I have had better. But considering that it is part of the total package, it was a good deal. If I ever go back to McPherson I will stay at the Best Western. Our stay here was great. Staff treated us like family, were super helpful, and kind. Denize was working at the front desk. She's is the best. Every hotel needs a Denize. The room was clean and comfortable. The breakfast was good, and was able to have a relaxing morning in the hot tub. The pool wasn't up for service, but they were working on it so I can't complain. I would definitely recommend this hotel to anyone and would stay there if I end up in McPherson again! Good hotel and the staff is extremely helpful. The breakfast in the morning is great and having the Montana Mikes makes for a great evening meal. Even though the rail road tracks are to the north, you don't hear the trains. This hotel has a nice workout room, hot tub and indoor pool for the winter and an outdoor pool for the warmer months. "Good value for older hotel"
Hotel is in several buildings, If in wrong building you walk outside to get to indoor pool. rooms were specious, clean but could use some updating. breakfast was typical. has restaurant and lounge attached but it closes at 9 PM. Good for the price. I stayed here with my daughter during a college preview visit. The rooms are clean and up-to-date. Used the in-room fridge and microwave. Internet was fast. At breakfast there was a nice variety of hot and cold items and the coffee was tasty. I will stay again if we visit McPherson. "Nice Motel in McPherson, Kansas"
The price is very reasonable. The hotel is older and very quiet, rooms are adequate and nice, with refrigerator, coffee, large TV channel selection. They have a great free breakfast. We stay here often. There is a Montana Mike's steakhouse in the motel, and several places to eat within easy walking distance. This is an average hotel with everything I need at a good price. I stay here at least once a year and don't consider other properties. Recent upgrades to carpeting are a plus. It's rare to find hotels that still have outside pools. Unfortunately, I've never been at this property during "outdoor pool" season. "Room was clean and comfortable "
The rooms have been updated within the last few years. King bed was comfortable, room has mini fridge, microwave and safe. With 2 adults, wish there were more than just 2 bath towels in room. There isn't a common hallway leading back to front desk and didn't feel like putting on a coat to ask for more. Didn't use any motel amenities this time, but their hot complimentary breakfast is good. Staff is friendly. The hotel was clean, staff very accommodating, and friendly. Nice small town hotel. Would recommend it to anyone. The breakfast was good each day we were there. I don't have anything else to say but haven't used the 200 characters yet. "Great improvements and sure to get better"
Very clean from the remodel and looks great. the pool is clean but no more hot tub. The only thing I will complain about is the lack of outlets, so bring a surge protector as you only get one or two. Hotel staff is very eager to please and stated they are working on getting more outlets in each room. I look forward to using this hotel again next time around. Stayed here for a get away with the kids. Nice, clean room! Quiet and comfortable. Breakfast is excellent as well. Staff was great and accommodating. Love the pool for the kids to swim. They had so much fun! Looking forward to our next stay. Clean and comfortable, what more can you ask? We have very frequently stayed at Best Westerns but to be honest we began losing faith in the organization. We used to stay at a BW in Ogalalla, NE and recently stayed in a BW in Ft Collins and to be honest both have become run down. We travel to Colorado and Utah annually and are now seeking a different place to stay. I hope the BW in Newton can stay as wonderful as it is. We will be returning. "Very Helpful/Friendly Front Desk Clerks and Newly Updated"
Were traveling through Iowa from Colorado to Michigan for the holidays. Traveled with our dog and many holiday packages. The staff were very helpful and we appreciated the newly updated facilities and safe parking area. It was a perfect experience - quality, service, and a WONDERFUL breakfast. Thank YOU! I am a 71-year-old woman, traveling alone from Northern Iowa, a 10-hour drive one way. These people gave such good service, the room was well-appointed, 1st floor for luggage, GREAT breakfast (the best I have ever experienced), and even a kind suggestions about a last-minute item from Walmart for my 6-month old granddaughter whom i had not seen since just after birth. Again, thank you! I loved it. We came to McPherson for a family Christmas. We had four rooms with some very specific requirements for each. The staff at Best Western was extremely helpful and courteous. Rebekah checked us in and worked very hard to ensure we had the rooms we needed. She was AWESOME! Thank you for choosing us for your families Christmas. We all like to hear that we have done a good job, so thank you for the kudos. I will pass this along to all concerned, especially Rebekah, so tries very hard to accommodate all of our guests. Great stay! Chose this hotel because the rate was good and it had a restaurant. Loved the rooms and the connecting steakhouse! Staff was very nice and accommodating. Location was good and close to downtown. If we come to McPherson again we'll stay here! Stopped in just for one night, was very satisfied with this hotel. The staff was great and accommodating, breakfast was to die for. It was nice and quiet, very comfortable beds/pillows. We had the Family Room which has 3 beds and very roomy. Thank you for the great review of our hotel. Yes the family rooms are very large, more than enough room to stretch out. I will pass you comment on breakfast along to our breakfast attendants. Once again, thanks for choosing the Best Western.